In the seventeenth century, glass furnaces represented a pinnacle of technology. True, the ability to achieve the high temperatures required to melt glass had been around for centuries – high enough to melt gold, silver and copper as well. What made the glass furnace remarkable was its refinement. It made efficient use of its hardwood fuel and was able to maintain a controlled, even temperature long before any thermometer could measure it. In fact, in the early seventeenth century, Galileo was only just beginning to use glass bulbs and tubes to measure differences in ambient room temperatures. 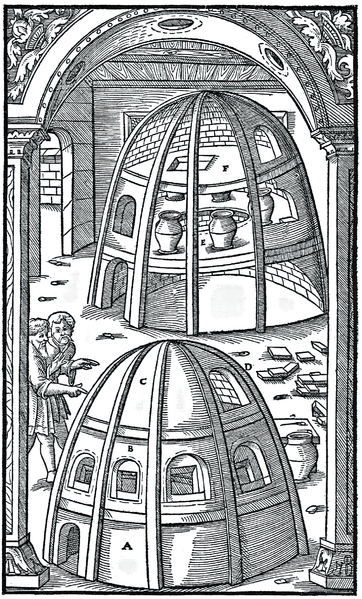 In Florence, the construction used was typical of the time throughout Europe, called a "beehive" furnace because its shape resembled the classic elongated dome of a beehive. A double wall, built of fire resistant bricks, provided further insulation, trapping heat inside. Vertically, the furnace was divided into three levels, each forming a wide open chamber. The bottom space was used to build the fire, and had one or two openings to the outside, used to add wood fuel, rake the coals, or shovel out ash. The second, central level was where the pots of glass resided. A central hole or "eye" on the floor directly exposed the fire pit below. The space directly next to the eye was the hottest, and temperature could be further controlled by moving the crucibles farther away or closer to the eye. A number of openings in the wall allowed gaffers access to the glass pots, and at least one larger opening was used to place new crucibles, or rearrange the existing ones. The upper chamber was used to control the draft, and sometimes for annealing. Again, a central hole in the floor of this (top) level allowed exhaust gasses to leave the glass chamber and an opening to one side vented the exhaust. 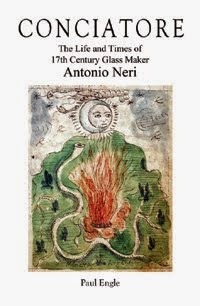 In his 1612 book, L’Arte Vetraria, Neri is careful to stress that only dry oak or other hardwood should be used because it burns cleanly, and will not deposit ash or creosote in the glass.